Critics have given a warm welcome to Poldark actor Aidan Turner's return to the stage after a 10-year absence, with one describing him as "a revelation". Turner plays an Irish revolutionary in The Lieutenant of Inishmore. The Telegraph's Dominic Cavendish wrote: "Turner's intense stare carries a surprising amount of charge away from the small-screen." "What's more of a revelation is his capacity to turn on a sixpence between hard-man and cry-baby." Martin McDonagh - behind Oscar-winning film Three Billboards Outside Ebbing, Missouri - wrote the 2001 play, which is directed by West End heavyweight, Michael Grandage. Giving the play four stars out of five, Cavendish added that "the deadpan effect" of Turner's performance was "at once comical and disquieting." The darkly comic and violent play is set in the early 1990s as the Northern Ireland peace process is taking its first steps. Since he took on the title role in Poldark back in 2015, the focus on Turner has often - some say unfairly - on his looks rather than his talent. 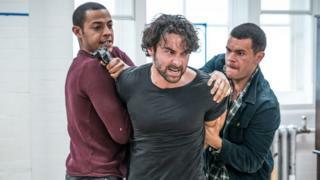 The Daily Mail's Quentin Letts was just one of the critics who made reference to this in his four-star review: "Aidan Turner plays an Irish gunman in one of the madder, braver comedies written in these islands in recent centuries. Ladies, sorry: He wears a T-shirt throughout." The Mirror's Deirdre O'Brien also gave the play four stars and posed the question: "Turner is a huge star, but does he have more than the ability to make hearts flutter? "Most decidedly, yes. He shines in this gloriously gruesome and hugely enjoyable satire." Guardian critic, Michael Billington, gave the play four stars, too, lauding both Turner and the production itself. "The Poldark star gives an excellent performance in a first-rate revival of Martin McDonagh's brutally funny play... Turner is excellent as Padraic, and plays him not as some wild-eyed barbarian but as a man endowed with a demented innocence. " The Stage's Natasha Tripney, gave a slightly more lukewarm three out of five stars but still described Turner as "impressive". "A white-vested Turner is impressive as Padraic, combining just the right level of charisma with a terrifying volatility and, underneath, something approaching sweetness." Ben Brantley reviewed the play in the New York Times, and was clearly impressed with the Irish star. "It's the casting of Mr Turner, though, that lifts this production into its own special universe of razor-edged inanity. "His Padraic is as smolderingly virile as his Poldark. "With flashing eyes that tear up at the drop of a cat and a muscular frame made for monument-worthy poses, this Padraic is a strutting contradiction of attraction and repulsion, daring us to question our conventional notions of the heroic." The London Evening Standard's Henry Hitchings was another reviewer who gave the West End revival four stars. "Aidan Turner, the swoon-inducing star of the BBC's Poldark, makes a magnetic West End debut in this grippingly unpleasant comedy. "Martin McDonagh's play, revived by director Michael Grandage as a blend of bloodbath and cartoon caper, pokes fun at the more demented forms of political extremism, and as the body parts pile up Turner switches nimbly between dead-eyed coolness and twinkly volatility." But it was left to The Times's Ann Treneman, who gave the play four stars, to suggest that perhaps Turner wasn't the star after all - it was his cat. "The star is not, as you may believe, Aidan Turner, who features in a certain TV series called Poldark... instead, all our eyes are on his adored feline, Wee Thomas." The Lieutenant of Inishmore is running at London's Noel Coward Theatre until 8 September.